God is BIGGER than people! When you boil it all down, our problems revolve around this one idea… we fear people way too much! We don’t fear God enough. In fact when I say, “God is bigger than people,” you may intellectually agree with that statement. Living it out is an entirely different animal. Why is THIS BOOK CALLED A “Bible”? What does the word “Bible” mean? What is a testament? What is inspiration? What is the canon? Today, we will examine some important words that we use to describe the Bible, discuss why the Bible is divided the way it is, and suggest the main theme of the Bible. Many scraps of the New Testament written on papyrus still exist. In fact, the oldest fragment of the New Testament is written on a small piece of papyrus. Papyrus was a very common writing material, and it’s almost certain that the original New Testament writings were recorded on papyrus. The oldest known papyrus fragment comes from Egypt and is dated about 2400 BC. However, few documents written on papyrus have survived that long because the material is not very sturdy. Papyrus was commonly used until the fourth century AD; after that, parchment became the preferred material. The Gospels were likely originally written on papyrus scrolls. Parchment (also called vellum) is a strong, durable material made of dried animal skin. The skins were tanned, scraped, and rubbed with chalk to produce a fine, smooth writing surface. The most complete ancient New Testament manuscripts are recorded on vellum. As time passed someone discovered that he could stack sheets of papyrus, fold them in the middle, and bind them into an easy-to-use book. A book bound this way was called a “codex” (plural “codices”). The word “codex” originally referred to the trunk of a tree, then a block of wood split up into tablets. The Epistles, being letters, were likely written on papyrus codices rather than scrolls. The word “scripture” is the translation of the Greek word graphe, meaning “writing.” The Latin word for writing is scriptum or scriptura. People often call sacred writings Scriptures. The Bible contains two testaments – the Old Testament (OT) and New Testament (NT). The word “testament” comes from the Latin translation of covenant, testamentum. In the Hebrew language, the word “testament” referred to a covenant, that is, an agreement, arrangement, contract, or treaty. A covenant usually consisted of promises, responsibilities and punishments for those who are part of the agreement. Although God made covenants with several people (e.g., Noah, Abraham, David), the most significant covenants are the ones God made with the nation of Israel through Moses (the Old Covenant) and the one made through Jesus (the New Covenant). Elements of the Abrahamic Covenant (Gen 12-22) span both the Old and the New Covenants. The OT forms about three-fourths of the entire Bible. It was written by about thirty different authors and covers about two thousand years of Israel’s history. The NT is primarily concerned with the life of Jesus Christ, the origins of the church, and the letters from various leaders of early Christianity to the churches instructing them what to believe and how to behave. The OT is not useless or obsolete, as some have suggested. However, it has been fulfilled by Jesus Christ (Mt 5.17). Thus, we currently live under the jurisdiction of the NT. The Old is useful, however, as a source of many timeless principles and examples. But we are not under the dictates of the Law because we live in the church age (Rom 6.4). NT believers follow the law of Christ (Gal 6.2) rather than the Law of Moses. General revelation: That information about God that comes to all men generally. General revelation is a universal witness to God’s existence, power and deity (Rom 1.20). All men know God because of creation (Ps 8.1?3, 19.1?6; Rom 1.18?20) and conscience (Rom 1.18?21, 2.14?15). General revelation is not a vehicle of salvation. Man is condemned because he perverts and rejects what knowledge of God he has. Special revelation: That information revealed to a specific individual or group (Heb 1.1?2). The Scripture is special revelation. Scripture is sufficient for condemnation, salvation, and sanctification. The canon (not cannon) is the list of authorized books that became part of the Bible. The word “canon” originally came from the word for a reed measuring stick. Hence, a canon is a rule, standard or guideline. Today a canon is a list or collection of accepted books. Canonization refers to the historical process whereby God, through the Holy Spirit, directed His people to recognize which writings were inspired. Illumination is the act of the Holy Spirit whereby He enables saved people to understand the true meaning (or significance) of the Word of God (John 14.26; 1 Cor 2.6?16; 1 John 2.20?21, 27). This is necessary because of the negative effects of sin on the human mind. Illumination results in a removal of the hostility toward Scripture due to man’s sinfulness and a certainty that the Scriptures are true and authoritative. The Holy Spirit is not revealing anything new to us, only illuminating our minds to see the truth that has already been revealed. The Hebrew Bible was divided into three different sections – The Law, The Prophets, and The Writings (or The Psalms). The OT was written in Hebrew (and a little Aramaic). Around 200 BC, scholars translated it into Greek, the common language of the day. This translation is called the Septuagint (sometimes abbreviated lxx). This is the Bible that Jesus Christ and the early Christians used. The following are the divisions of the lxx: Law, Poetry, History, and Prophets. The Latin Bible is often called the Vulgate. The word “vulgate” comes from the word “vulgar,” which means “common.” Latin used to be the common language of the church and of scholarship. The great scholar Jerome translated the Bible from Hebrew and Greek into Latin in the fourth century, and Jerome’s Vulgate was the most common version in the western church for centuries. The Latin Bible reflects the same divisions we have today—Old Testament and New Testament. Just like any other book, the Bible has a main theme or focus. Some would suggest that the main theme is Jesus Christ or the message of the Gospel. But there is a broader approach that encompasses the whole Bible. Throughout the Bible, God repeatedly expresses the following idea: “I will be their God and they shall be my people” (Gen 17.8; Jer 32.38; Ezek 11.20; 2 Cor 6.16). Everything contained in the Bible seems to be somehow related to this general idea. One scholar puts it this way: “God for His own glory has chosen to create and gather to Himself a group of people to be the subjects of His eternal kingdom; to praise, honor, and serve Him forever; and through whom He will display His wisdom, power, mercy, grace and glory.” Thus, the overall theme of the Bible is how God enters into a positive relationship of loving sovereignty with mankind. God recognizes a group of people as his own special people, and they recognize Him as the one true God. The contents of the Bible express and reveal this relationship between God and man. This main theme of God’s desire to enter into fellowship with man has been stated at various times and in different ways throughout history. These ways, or arrangements, between God and man are usually called dispensations. Many scholars recognize seven different dispensations. In each dispensation, God reveals certain information about Himself and requires certain responses from man. As God reveals more information, man’s responsibilities change. But in every dispensation, the same theme is played out: God desires to enter into a relationship of loving sovereignty with man. Unfortunately, in every dispensation, man fails to perform his part of the arrangement. We sometimes focus so much on the details of the Scripture that we fail to grasp its overall arrangement. So let’s take a broad view of the Bible. The Bible: 66 separate books in one book—Old Testament and New Testament. The OT is primarily about the nation of Israel; the NT is primarily about Jesus Christ and the Church. The Old Testament is a book of unexplained ceremonies, unfulfilled prophecies, and unsatisfied longings. It looks forward to a perfect prophet, priest and king. The whole OT is preparation for a Messiah, One who would fulfill all OT expectations. Gospels: Matthew, Mark, Luke, John. The Gospels introduce the person and work of Jesus Christ. They are introductory, not explanatory. Acts: The proclamation of the person and work of Christ and the history of the early church. Epistles: The interpretation and explanation of the person and work of Christ. Revelation: The culmination of the work of Christ in human history. The OT is preparation for a perfect man, the Messiah. The NT is the manifestation of the God-Man, Jesus Christ. The Bible is a wonderful, valuable book. We should thank God that He took the initiative in communicating to man. It should be our desire to get to know the Bible better and to submit to its principles. Why do we think that the Bible is an important book? It’s the word of God, authoritative, true, and binding. Why don’t we follow the OT like we do the NT? Christ fulfilled the OT, so we are not under the dictates of it. We follow the law of Christ. Are English versions of the Bible inspired in the same sense the originals were? No, only in a secondary “derivative” sense. Is special, direct revelation from God to man ongoing, or did it end? Direct revelation from God has ended. The Bible is God’s direct communication to us. The prophets and apostles received direct revelation from God; we do not. We believe the canon is closed. What is the main theme of the Bible? “I will be their God and they shall be my people” — God’s desire to enter into a relationship of loving sovereignty with man. Paper was invented by the Chinese and was unknown in the West until the time of the Crusades. Paper replaced vellum by the fifteenth century, shortly before the printing press was invented. LXX is the Roman numeral 70. Tradition suggests that 70 scholars worked on translating the Hebrew into Greek. John MacArthur, How to Get the Most from God’s Word (Word, 1997), p. 146. There are over 100 Messianic prophesies in the OT. This plague not only finalized the ten plagues, it also showed the utter impotence of the Pharoah. The Pharoah, charged with maintaining control over the Ancient Near Eastern (ANE) world, was shown powerless over his own house. Not one Egyptian firstborn child survived this plague, not even Pharaoh s.
This plague struck the firstborn son of every Egyptian, from the highest ranking official (Pharaoh s son) to the lowest position in a household (a slave woman). Later, in 12.29, Moses uses a similar merism to show that this was complete. The firstborn were important. The people of the ANE greatly esteemed the first born. We know that the Israelites held the firstborn in great esteem. However, this was not unique to the Israelite community. All ANE peoples valued their firstborn. Some cultures sacrificed their firstborn to the gods. The supposed idea was that the firstborn, being greatly valued, provided the most excel- lent sacrifice. The Egyptians valued their firstborn. The firstborn son of any Pharaoh was a cherished possession. He was the Pharaoh-to-be. Egyptian pottery, inscribed walls, and various pictures illustrated the gods mold- ing and extending life to the young pharaoh-to-be. The goddess Hathor nurtured the pharaohs-to-be. This plague showed the impotence of the gods and Pharaoh s inability to protect his predecessor. The Egyptians revered the firstborn cattle. The sacred Apis bull was a firstborn bull. This was a very important bull. The Egyptians identified 25 characteristics of the perfect bull. Being the firsborn bull was its chief characteristic. When a bull passed the test, it became the revered Apis bull. So revered, these bulls enjoyed a king s burial. A mammoth tomb was constructed which contained a number of mummified Apis bulls in elaborate sarcophaguses. Then the LORD said to Moses, Stretch out your hand toward the sky so that darkness will spread over Egypt darkness that can be felt. So Moses stretched out his hand toward the sky, and total darkness covered all Egypt for three days. No one could see anyone else or leave his place for three days. Yet all the Israelites had light in the places where they lived. Some have speculated that this was actually a common sandstorm called a Khamsin. They base this on the fact that the people felt the darkness and the people could not leave their house. The problem with this view is that Khamsins were common and would not be considered supernatural phenomena. The Hebrew specifically states that this was a darkness. Moses de- scribed this darkness as one that was total (v22) and could be felt (v21). The phrase total darkness is considered a superlative in Hebrew grammar. A Hebrew writer would use a superlative when he wanted to demonstrate that his subject is like no other. When Moses used total darkness (a superlative), he wanted his readers to understand that this darkness surpassed all other kinds of darkness; it was a supernatural darkness like no other. Anyone with a basic exposure to Egyptology has heard of the sun god Re. Re was the foremost god of the sun. Even a hymn was composed to the sun. Hail to thee, beautiful Re of every day, who rises at dawn without ceasing, Khepri wearing (himself) with labor! Thy rays are in (one s) face, without one knowing it. Fine gold is not like the radiance of thee. Thou who has constructed thyself, thou didst fashion thy body, a shaper who was (himself) not shaped; unique in his nature, passing eternity, the distant one, under whose guidance are millions of ways, just as thy radiance is like the radiance of heaven and thy color glistens more than its surface. Pharaoh himself was called the Son of Re. Venerated as the one who illuminated the land of Egypt, the Son of Re was in charge of the created order (m^u^T) including the sun s illumination. Therefore, this plague demonstrated that Pharaoh was not in control. Many other gods were associated with the sun. The following abridged table appears in The Complete Temples of Ancient Egypt. Now we come to one of the plagues that everyone has heard about — the plague of the locusts. As with all of the other plagues, this one is also designed to show who the true Sovereign is. The last plague was unheard of in Egypt. Hail was not (and still is not) a problem in Egypt. If they get hail, it is insignificant. Unlike the hail, the locusts were an occasional problem. This time they were miraculously multiplied. Locusts were one of the most dreaded insects of the Ancient Near East (ANE). It is common knowledge that locusts destroy crops. In a culture without crop dusters and modern chemicals to control locusts, a locust plague brought considerable destruction. Even, today, with all of our technology, pesticides are still not very effective. Locusts are able to flap their wings non-stop for seventeen hours. Locusts can fly at 10-12 miles an hour for twenty hours or more. Locust swarms have been spotted 1,200 miles out at sea. Locusts destroy everything edible with voracious appetites. When locusts swarm, the results are devastating. Throughout history, locust swarms have produced great famines. In 1865 locusts covered the ground of Joppa. So numerous were the locusts that the ground was covered to a height of several inches for miles. In 1889 a locust swarm covered an area of 2,000 square miles. In 1915 a locust swarm flew over Palestine for five days, darkening the sky and leaving droppings. From 1926 40 locusts swarmed the plains of Africa including Timbuktu, Senegal, Sierra Leone, and Khartoum. The swarm lasted fourteen years devastating five-million square miles of Africa (double the size of USA). In 1963 locusts invaded South Africa. The Department of Agriculture pushed 200 spray trucks into service, 1,000 volunteers, and $30,000 a day was spent to control the pests, yet the modern day technology still could not detain the devastation until 30,000 square miles were destroyed (an area about the size of Maine). Even though locusts have produced famines before, the locust plague of 1444 BC (circa) was the most severe. With the previous plagues, the Egyptians have already lost much cattle, crops, and servants. With the locust plague, the devastation completes the destruction on Egypt s crops. Besides the obvious vegetation destruction, this plague would constitute yet another blow to their religious system. There was a god who protected against the locust (Senehem). He was a minor deity. Yet, it was the function of many gods to protect the fields, vegetation and all that was destroyed by the locusts. This plague adds to the cumulative effect that Pharaoh is impotent and their gods are not able to secure order. In verse 16, we see that Pharaoh is getting more desperate (“quickly summoned”), yet he will not bow to God’s wishes, EVEN after just giving a statement of repentance. Some have suggested that the plagues were caused by natural events. They opine that the Nile became red because algae flowed down from the mountains. The algae forced the frogs on the land. The death of the frogs brought the flies. The flies bit the livestock transferring the disease anthrax which eventually affected the human population with the boils. These naturalistic interpretations of the plagues cannot reasonably account for the plague of hail. Moses, the author of Exodus, notes that this hailstorm was like no other. Egypt had never undergone such a grievous hail storm before. Two things put this plague in the realm of the miraculous. First, Egypt receives little rain. Cairo receives only about 2 inches of rainfall annually. South of Cairo, throughout most of Egypt, rain is rare. The announcement of this plague to Pharaoh would be akin to God’s announcement of a flood in Noah’s day. Second, this plague discriminated. Hail fell on all of Egypt, except the place where the Israelites lived. If rain was to fall in Egypt, it would have fallen in Goshen (near modern-day Cairo). For a storm of this magnitude to appear throughout Egypt but not in Goshen is remarkable in its own rite. This plague not only included a grievous hail, but it also provided a force shield for God’s chosen people. In at least two different ways, this plague attacked the belief system of the Egyptians. First, this plague attacked a goddess who controlled cosmological events. Nut was the sky goddess. Second, this plague af- fected the worship system of Egypt. The gods Isis and Seth had responsibilities related to the crops. Crops, such as flax, which provided linen for the garments of the priests throughout the land was destroyed by this plague. In the lesson on the Plague of Livestock, we saw that the plague already wiped out most of the cattle of Egypt thereby forcing the Egyptians to secure cattle from other countries. Inscriptions on certain Pharaohs’ tombs record the efforts they made to improve their livestock. Entire herds were brought in from the south and from Lybia. On at least two occasions, Syrian cattle were sent to Egypt. Much of the cattle they just secured would have been destroyed by the hail. Due to the rather steady climate, the Egyptians had a number of harvesting and planting times. Yet, this plague was timed so that it brought devastation on two key crops, at harvest time. Flax and barley supplied clothes and food. Application: This plague expresses the patience of God. He was not using the plagues as an unmerciful punishment on the Egyptians. He wanted repentance. Let my people go, so that they may worship me, 14 or this time I will send the full force of my plagues against you and against your officials and your people, so you may know that there is no one like me in all the earth. 15 For by now I could have stretched out my hand and struck you and your people with a plague that would have wiped you off the earth. 16 But I have raised you up for this very purpose, that I might show you my power and that my name might be proclaimed in all the earth. (Ex 9:13–16). In the most vivid language, God said that He was patient and by now, could have “wiped them off the earth.” Not only does the word “wipe” mean to destroy. It means to “erase any memory of them.” Why so strong? The Egyptians made it a practice to rewrite their history. Hatshepsut was a daughter of a pharaoh. She eventually became a pharaoh, herself. This was highly controversial as it was a place reserved for men. After her death, her stepson, Thutmosis III became pharaoh and made it one of his campaigns to erase every inscription made about Hatshepsut. He was so successful that it was not until 1903 AD, when Hatshepsut was discovered. Unlike the Egyptians, God’s patience is recorded in history. Why? Because the plagues are not about destroying the Egyptians. The plagues are designed to demonstrate God. He is and always has been the Sovereign. Unlike the magicians who could no longer stand before Moses, God stands Pharaoh up and shows great patience and restraint. It is God who is being glorified and set in complete contrast to Pharaoh and the rest of the gods of Egypt. 10 So they took soot from a furnace and stood before Pharaoh. Moses tossed it into the air, and festering boils broke out on people and animals. 11 The magicians could not stand before Moses because of the boils that were on them and on all the Egyptians. 12 But the Lord hardened (“made heavy”) Pharaoh’s heart and he would not listen to Moses and Aaron, just as the Lord had said to Moses. The boils showed the impotence of the Egyptian gods. According to Egyptian legend, the goddess Sekhmet had the power over disease. She controlled its extent and severity. The superstitious Egyptians wore amulets to keep the evil spirits away so Sekhmet would be able to control the diseases. The god Serapis was charged with the responsibility of healing. Imhotep, the god of medicine was the guardian of healing sciences. 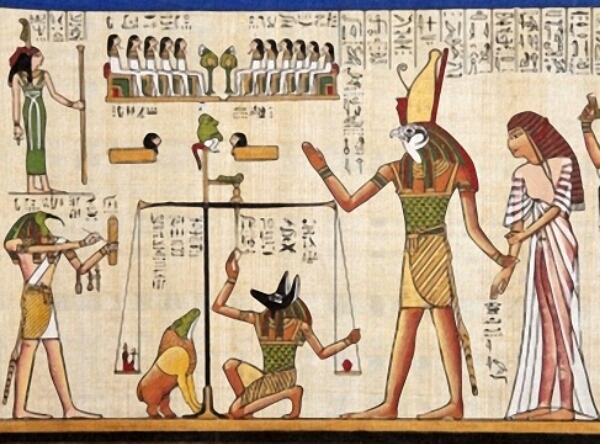 These Egyptian gods were shown to be impotent when it came to controlling this plague. The boils may have been a vivid object lesson to Pharaoh. As one commentator says, “This was a poetic justice.” 1 They would have been illustrative of Pharoah’s harsh treatment on the Israelites. Pharaoh forced the Israelites to slave over the brick making furnaces. Hard long, excruciating days with soot covering the body and pure exhaustion, it was time for God to exact that on Pharoah… causing the furnace dust to create a far more physical problem–festering boils! The Egyptians personally endured a direct, painful affliction. Frogs, gnats, swarms of biting insects were terrible conditions. Yet, these could be contained by mosquito netting and other methods. Boils, on the other hand, came from the body, itself. They were excruciatingly painful and unrelenting. They were so debilitating that Pharaoh’s magicians were unable to appear in Pharaoh’s court. How bad were the boils? The Hebrew word translated “boil” 13 times throughout the Old Testament. It was a condition which the ANE people dreaded. In Leviticus 13.18–21, boils were akin to leprosy. In 9.9, the boils were festering. That is, they became blisters. They may have been open, infectious sores similar to what Job suffered in Job 2.7. In that passage, Job found some relief by scraping his skin with pieces of clay. His affliction was so bad that he thought death was the only way to find lasting relief. Application: When God is obviously at work, you cannot expect the world to understand it, appreciate it or even acknowledge that God was involved. So, the world has developed phrases like “Mother Nature” or “Natural Disasters” to explain our world. God often does use secondary causes to bring about His plan. What we mean by that is that God uses penicillin, developed by the God-given skills of man, to bring about health. With the plagues, God DIRECTLY and SUPERNATURALLY intervened. 5 The LORD set a time and said, “Tomorrow the LORD will do this in the land.” 6 And the next day the LORD did it: All the livestock of the Egyptians died, but not one animal belonging to the Israelites died. 7 Pharaoh sent men to investigate and found that not even one of the animals of the Israelites had died. Yet his heart was unyielding and he would not let the people go. This word “cattle” is a generic word for livestock which includes cows, sheep, horses, donkeys, and camels. Basically, this refers to all of the domesticated animals which were bought and used as tools for various agricultural uses. Two reasons are given. First, the plague was directed at the “cattle in the field“ (v 3). Therefore, when verse 6 states that “all the cattle of Egypt died” it refers to “all the animals in the field.” The ones in the stables and enclosures were not affected. Another possibility may be that the Egyptians purchased cattle from the Israelites between this plague and the next. It makes sense that the Israelites may have sold some of their cattle to the Egyptians. Imagine also the profit the Israelites would have made selling the prized cattle commodity. Both seem plausible and may have been true. Some people like to think that the livestock, in the fields, died because of the rotting frogs. Their decomposing bodies would have created anthrax. When we think about the hideous nature of these plagues, we need to keep in mind that all of these dead things were piled on top of each other. It is difficult to think that they had much time to clean up between each plague, especially given the extreme amount of dead carcases. With that said, this plague was truly miraculous and did not involve a natural/biological reason. Why not? Because the plague was given in unnatural terms. vs 3 “The hand of the Lord” was involved. If you remember, the magicians said the finger of God was involved. Now, the text extends it to the “hand of God.” This is an interesting thing to note in these plagues. Not much is to be made of the “finger” vs. “hand.” The point is… God was DIRECTLY involved. vs 4. “I will make a distinction.” Only the Egyptians’ livestock would be killed. The Egyptians would be cursed and the Israelites would be blessed in this plague. vs 5 ff The exact time was predicted, the plague occurred. The plague crippled Egypt economically and militarily. This plague was especially destructive. It struck the core of Egypt’s livelihood. Flies, gnats, and frogs are terrible nuisances, but this particular plague brought an especially difficult hardship on Egypt. The Egyptians depended on horses, camels, donkeys, and oxen. Egypt introduced the horse to the battlefield. The horse was much swifter than the camel which made it the superior fighting machine. Without horses, their military strength was crippled. Camels and donkeys were used as load bearing animals. They would carry equipment and supplies for the farmers. Oxen were used for plowing the fields. Without them, they were unable to plow the ground. It may be interesting to note that this plague may have destroyed their agricultural machinery (camels, oxen, and donkeys) at the height of their planting season. Where do you think the Egyptians would have to go to replace their livestock? Of course, the Israelites. Hence the blessing. The Israelites would have prospered over the bartering and selling of their livestock. The plague was directed against some of the Egyptian gods. Cattle were sacred animals to the Egyptians. So sacred were these ani- mals that another nation ultimately defeated the Egyptians in battle by using cattle as a screen. The Ptolemies sent them ahead of their army. The Egyptians did not want to hurt the animals. As a result, the Ptolemies capitalized on this weakness and defeated the Egyptians. At least three gods were directly affected by the plagues. All three gods represented as cattle – the Apis Bull, Hathor, and Mnevis. Apis Bull: This bull was very sacred to the Egyptians. Egypt was never without an Apis Bull. This was a special bull identified by twenty eight different markings. Whenever a new bull was chosen to replace a deceased bull, the Egyptians would have a special celebration. So sacred was this bull that the Egyptians constructed an elaborate burial chamber for the Apis Bulls. Hathor: The mother goddess Hathor was in the form of a cow. The queens were often depicted with the horns of Hathor on their head. Mnevis: A sacred bull at Heliopolis was associated with the sun god Re. If you have ever been on a fishing trip to Canada or Northern Wisconsin, you will identify with the nuisance of biting black flies. Imagine intensifying the situation with a number of other flying insects. Imagine such a swarm, that every time you took a breath, you would have to shield your mouth so as not to have a “fly lunch.” Imagine what it was like in Egypt! 20 Then the LORD said to Moses, “Get up early in the morning and confront Pharaoh as he goes to the water and say to him, ‘This is what the LORD says: Let my people go, so that they may worship me. 21 If you do not let my people go, I will send swarms of flies on you and your officials, on your people and into your houses. The houses of the Egyptians will be full of flies, and even the ground where they are. There is some question about the variety of fly that was involved. The word “flies” may be italicized in your Bible. It is italicized in the KJV indicating that it is not in the Hebrew text. The only word that does appear is the word “swarms.” This is a generic word which did not specify a particular kind of fly. Literally, the word “swarm” comes from a Hebrew word that basically means “mixture.” This swarm may have been a mixture of flying in sects including mosquitos, flies, horse-flies, etc. The Septuagint (LXX) uses the Greek word kunomuia which is interpreted, “dog-fly.” A dog-fly was a ferociously nasty biting insect. 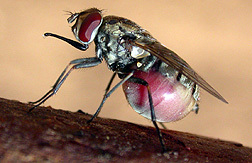 Today, it is known most commonly as the “stable fly.” It was brought to the US in the 1700s. The Stomoxys calcitrans (‘sharp mouth’ + ‘kicking’). Why is this of any importance? The translators of the LXX lived in Egypt. They were accustomed to the conditions of life in the land and would have been bothered by the same fly. The point simply is that this swarm may very well have included a number of flying insects, including the biting and stinging ones. A grievous plague indeed! God gave Pharaoh another length of rope with which Pharaoh will eventually hang himself. 21 If you do not let my people go, I will send swarms of flies on you and your officials, on your people and into your houses. 22 “ ‘But on that day I will deal differently with the land of Goshen, where my people live; no swarms of flies will be there, so that you will know that I, the LORD, am in this land. 23 I will make a distinction between my people and your people. This miraculous sign will occur tomorrow.’ ” 24 And the LORD did this…. 1. The miraculous sign was unmistakably against the Egyptians. They could not deny the fact that they were on the wrong side, serving the wrong gods. 30 Then Moses left Pharaoh and prayed to the LORD, 31 and the LORD did what Moses asked: The flies left Pharaoh and his officials and his people; not a fly remained. 32 But this time also Pharaoh hardened his heart and would not let the people go. The word used here for the hardening of Pharaoh’s heart is “made heavy.” This phrase is damning. It did not simply mean he was depressed or saddened, in our vernacular. To the Egyptian mind it meant a pronouncement of eternal doom. The common illustration above shows this thinking. The falcon god, Horus, leads a royal down the hall of death. There, they put the royal’s heart on a scale to weigh it against Ma’at’s “feather of truth/harmony/balance.” If the heart is lighter than the feather, the royal gets to continue down the hall to enjoy a peaceful eternity. If the heart is heavier than the feather, that indicates that this person has committed sins of great gravity and contributed to the disharmony of the world. This sinner will be devoured by the demon/goddess Ammit (part hippo, lion, crocodile). Flies and hornets were common symbols of Egypt. Certain flies were associated with their gods. “The Ichneumon fly . . . was considered the manifestation of the god Uatchit.” This fly drills into the bodies of other in sects and embeds its eggs. The larvae feed on the insect, eventually killing it. Though fear some in appearance, this fly was desired by farmers. It limited the number of other crop destroying insects. Kheprer/Khepri was the god pictured as the flying beetle. This god was known as the “resurrection god” who brings life to himself. The reference in verse 21, “on the ground” may be referring to this particular beetle. Flies were used as awards. A victory neck lace was one of the most sought after awards. This necklace was made up of three gold flies. Called the “order of the golden fly,” this necklace served as a military decoration given by the Pharaoh to his elite soldiers. Francesco Tiradritti, ed., Egyptian Treasures (Harry N. Abrams, Inc.) 286. Unlike the first two plagues, this one was unannounced. Why was no announcement made? Pharaoh lied. In Ex 8.9 he said he would let the people go. When the plague of the frogs ended, and he had relief, he would not let the people go. 17 They did this, and when Aaron stretched out his hand with the staff and struck the dust of the ground, gnats came upon men and animals. All the dust throughout the land of Egypt became gnats. 18 But when the magicians tried to produce gnats by their secret arts, they could not. And the gnats were on men and animals. Do you see the two “bookends” in this passage? These bookends highlight the thorough decimation of the powers of Egypt. The priests mimicked the other signs– staff into snakes, in Nile to blood, frogs from the water. The priests admit this is of divine origin. The Hebrew word translated “gnats,” in our Bibles has the “-im” suffix. When a Hebrew word ends with “-im,” it means that the word is a collective. This is a collection of winged, biting insects. Like the Hebrew word, our English word “gnats” is actually a broad term referring to winged, biting and non-biting insects. We have an entire gamut of gnats, mosquitos, sandflies, or lice. One writer thinks it was a stinging type of mosquito. I will make your off spring like the dust of the earth, so that if anyone could count the dust, then your off spring could be counted. The problem with this view is that the language in Exodus is not metaphorical. It was real. 16 Then the LORD said to Moses, “Tell Aaron, ‘Stretch out your staff and strike the dust of the ground,’ and throughout the land of Egypt the dust will become (hy:h;) gnats.” 17 They did this, and when Aaron stretched out his hand with the staff and struck the dust of the ground, gnats came upon men and animals. All the dust throughout the land of Egypt became (hy:h;) gnats. In these verses Moses chose to use the He brew word haya (hy:h;) which means “to come into being, or be come.” Moses wrote both Genesis 13.16 and Exodus 8.16–17. If Moses intended Exodus 8.16–17 to be a figure of speech like Genesis 13.16, we would expect this passage to say “the gnats were like the dust of the earth.” Since we find no evidence that Exodus 8.16–17 contains figures of speech, and the language is clear that the dust became (hy:h;) gnats, we are to conclude that this was a miracle, like the rest of the plagues. To conclude that these gnats were not miraculously formed is not biblically (i.e., exegetically) based. Perhaps, instead of targeting a certain Egyptian god, this plague was designed to frustrate the religious system of the day. Gnats were considered ceremonially unclean by the Egyptian priests. The priests of Egypt took pride in that they were physically pure. They shaved their heads, dressed in beautiful robes, and unlike the Egyptian population at large – washed frequently. Gnats greatly disturbed their ability to keep religiously pure. In those days, one could not purchase an in sect bomb to rid the area of gnats. In one medical document from the ANE, the most effective sub stance in ridding oneself of gnats was to cover himself with fish spawn. Imagine the defilement that the priests would have experienced, first being covered by gnats, and second, covering themselves with slimy fish eggs. This certainly would frustrate their worship of the gods. Pharaoh, a god on earth, surrounded himself with magicians to do great and powerful acts. Even when it was obvious to everyone else that there is something greater than man, involved, Pharaoh made his heart even more calloused. Magic, as good as it was, is severely limited by the true omnipotence of Yahweh. Brevard Childs, The Book of Exodus, The Old Testament Library (West minster Press), 156. John Davis, Moses and the Gods of Egypt (Baker), 103.